Going through a divorce or any type of family law dispute is never easy. You will be making critical decisions that will affect your and your family’s future. Hiring the right attorney is the first — and most important — step. Make sure you have a lawyer with experience and who is willing to listen and share your commitment to finding the best possible outcome.I am attorney PJ Hartman, in Albuquerque. I practice exclusively in the area of New Mexico divorce and family law, and I am a board-certified family law specialist. * Over my 15 years of experience, I have dealt with all types of domestic relations disputes, and have built a strong track record for helping people reach effective solutions that protect their best interests now and into the future. 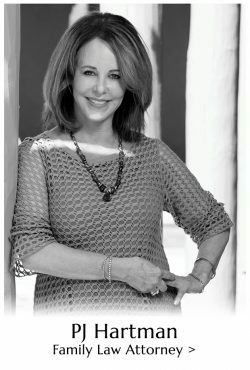 Supported by an experienced professional staff, I place a special focus on helping my clients resolve their disputes outside of traditional contested divorce litigation, by guiding couples through a comprehensive and balanced approach to divorce. I work to find common ground to resolve differences amicably. Whether through skillful negotiations or a formal mediation process, clients usually find they emerge from the process in a better place and are able to resolve future issues with their ex-spouse more effectively. And you won’t have to worry about being passed down to an associate attorney. I will stay involved with you after a final agreement is reached. And if the final judgment isn’t working out as you and your ex-spouse had intended, I can walk you through the modification process to help adjust for changing family needs. If you have divorce and family law questions, contact my office. You will find a lawyer who is an advocate dedicated to helping you reach your goals and removing as much stress from your life as possible. To schedule a consultation, call 505-247-3335. 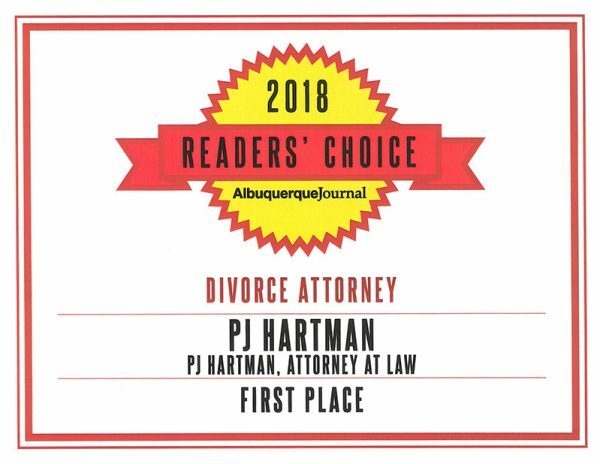 PJ Hartman is the proud recipient of the Albuquerque Journal’s 2018 Readers’ Choice Award for best divorce attorney. Thanks to all who voted!